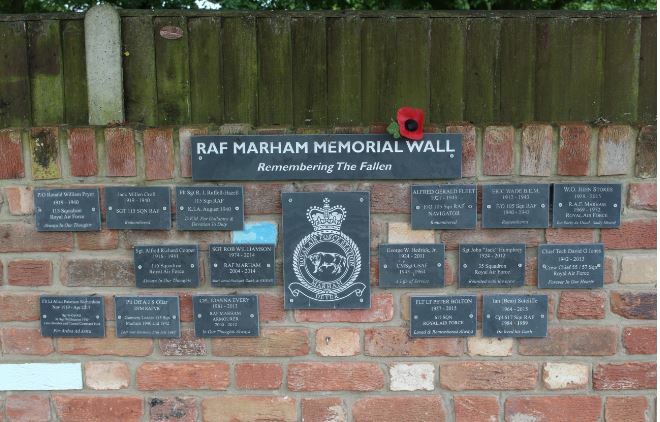 The concept for the RAF Marham Memorial wall was discussed as early as the end of 2015. When it was announced that No 3 hangar would be demolished as part of the preparation work for the arrival of the F-35, a request was made in early 2016 to the project ANVIL team to reclaim some of the original Peterborough ‘’Reds’’, the bricks which were originally used to build the RAF Marham hangars back in the expansion of the aerodrome in 1934. The request was for 1500 bricks, which the AHC could re-use to build a memorial wall to all those who had served at RAF Marham and who sadly were no longer with us. The design for the wall was agreed by the AHC Committee, the Works Management Flight and the Station Commander and a volunteer company came forward to build it. A1 Fencing, a Mr Hardy and his son built the wall utilising the reclaimed bricks in a location which the AHC Committee had set aside as the new RAF Marham Memorial Garden project. In November 2016 the wall was finished and populated with the memorial plaques already ordered. The Wall and the Memorial Garden was dedicated to the enduring memory of all those who had served at RAF Marham and were no longer with us. The dedication was attended by relatives of some of the airmen and women on the wall, local dignitaries, the Station Commander and the Station Chaplain who blessed the memorial were all in attendance. The Wall since being blessed has gained a few more plaques, mainly from the WWII era, but a few from more modern times. A fitting and lasting tribute to the dedication and loyalty of Marham personnel. The future for the wall will see more bricks being reclaimed from No 1 hangar when it is demolished. These bricks will be used to build two wings on the current wall, these wings will be set aside for complete crews of aircraft lost in action or training. The memorial plaques can be ordered and purchased via the RAF Marham Aviation Heritage Centre Curator, who will guide you through the ordering process. In the RAF Marham Aviation Heritage Centre Memorial Garden there is also the RAF Marham War Memorial. This memorial was designed and built by SAC(T) Jamie Fowler, a member of the AHC team at the time. Centrepiece to the memorial is a propeller blade from a No.7 Squadron Short Stirling W7441, which was shot down over Denmark by a night-fighter on the night of 29 September 1941, whilst returning from a raid on Stettin. The propeller blade was recovered from the seabed in recent years by a relative of one of the crew and donated to the RAF Marham Aviation Heritage Centre when they heard about the memorial project. The Crew fates were as follows: Sgt C J Cobbold (PoW), Sgt E D Tovey (KIA), Sgt J J Copley (PoW), Sgt D Y Neil (PoW), Sgt A Donaldson (PoW), Sgt E J Rodger (KIA), Sgt C W Fulbeck (KIA). No.7 Squadron were based at the time at Oakington, yet there are connections between that aircraft and RAF Marham that make the dedication of this blade as our memorial very special. The night before the aircraft went on its final trip, it diverted into Marham as a land-away from Oakington, returning to its home base the next morning. Also, Sgt Copley had served at RAF Marham, indeed he was the first airman in World War Two at RAF Marham to receive a medal for gallantry. When serving with No 38 Sqn at RAF Marham operating on Wellingtons, he was awarded the Distinguished Flying Medal (DFM) – you can read more of his story in the AHC.